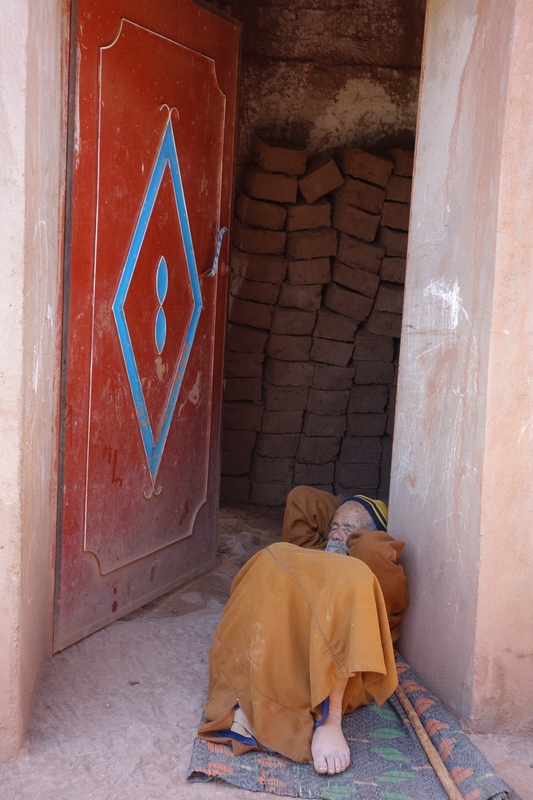 I have been dreaming of traveling to Morocco for many years. 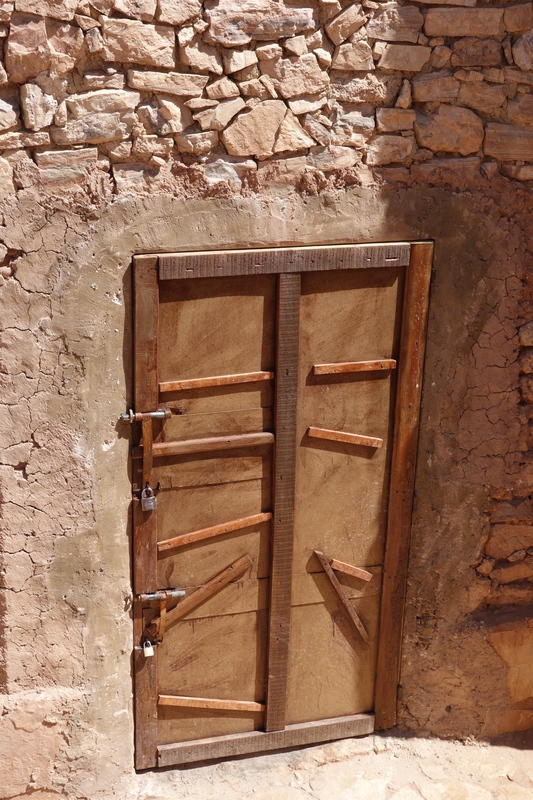 I recently went there and my expectations were surpassed. 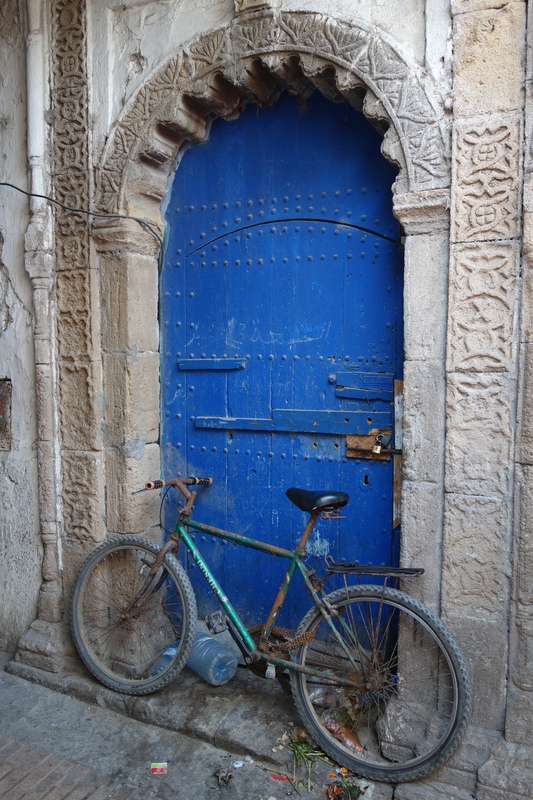 Traveling has always fed my soul emotionally and creatively. 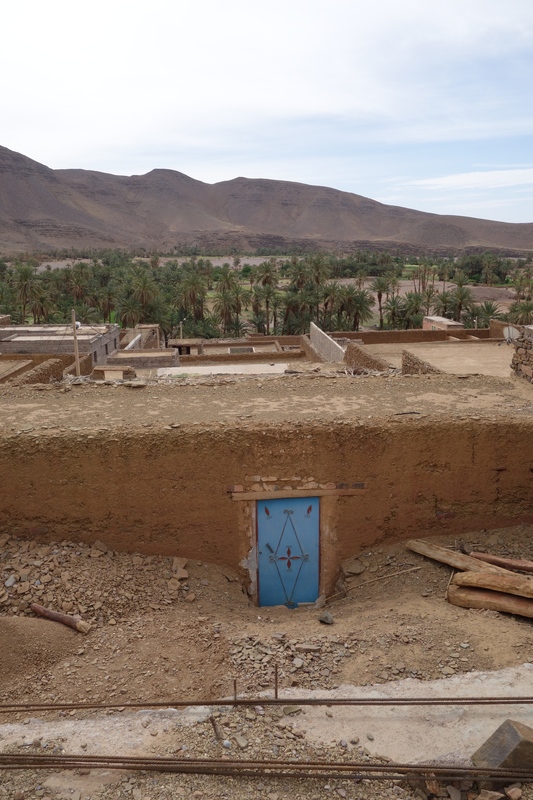 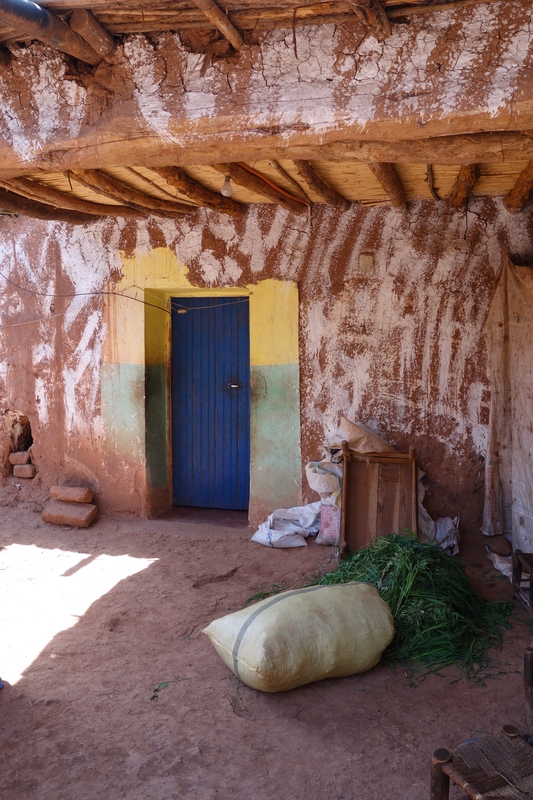 In Morocco almost all buildings, whether residential or commercial, are painted the same color and most are made from the earth. 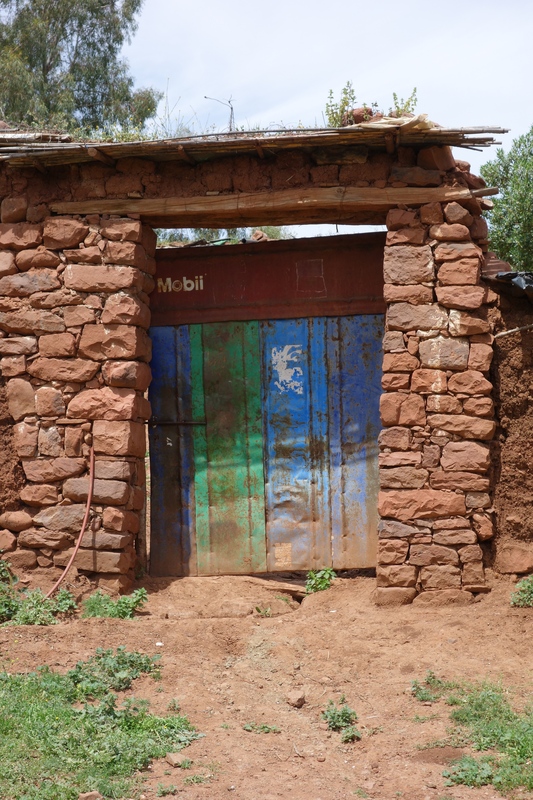 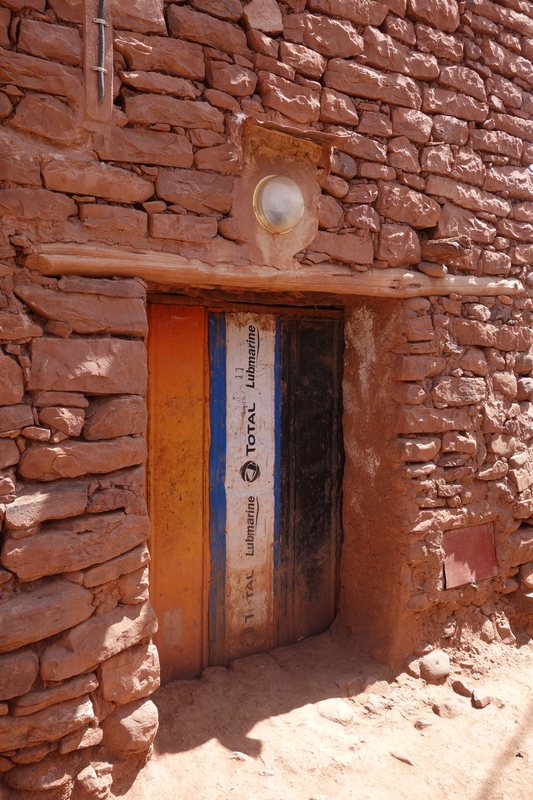 The newer structures are constructed with concrete but still remain painted a natural earth color. 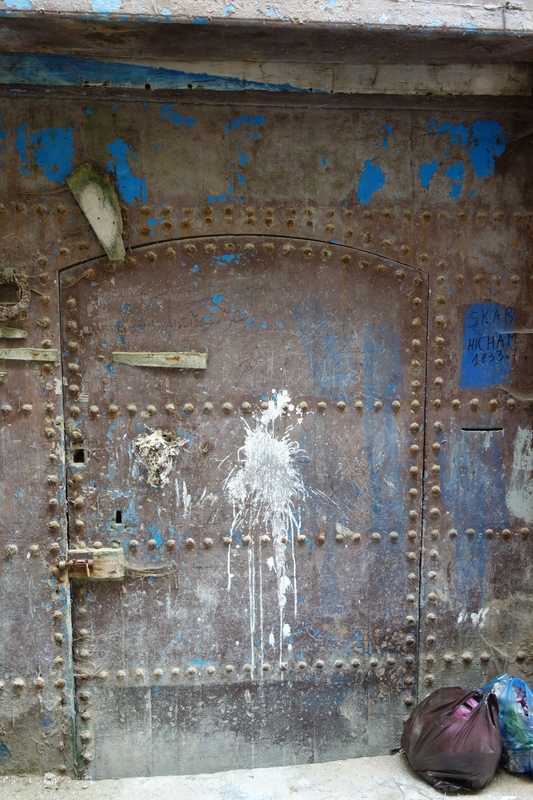 Near the coast, however, you may see a few buildings painted white. 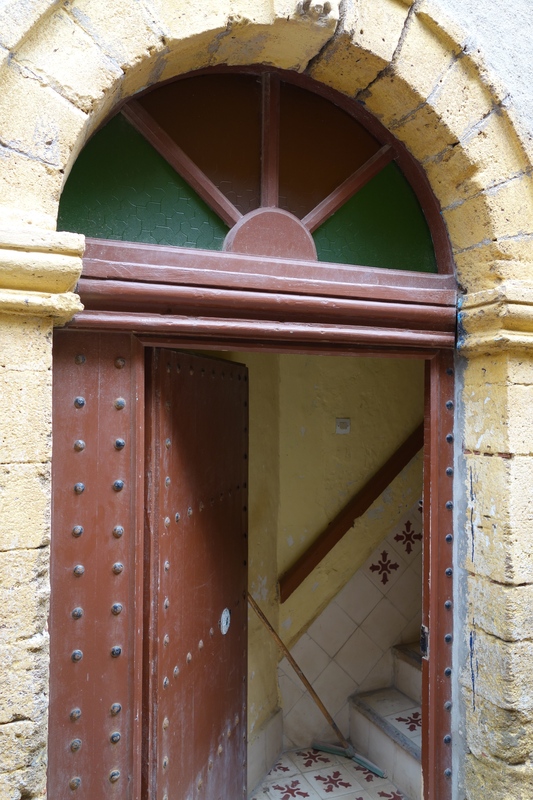 Except for the front door, there is very little architectural or design detail in the buildings. 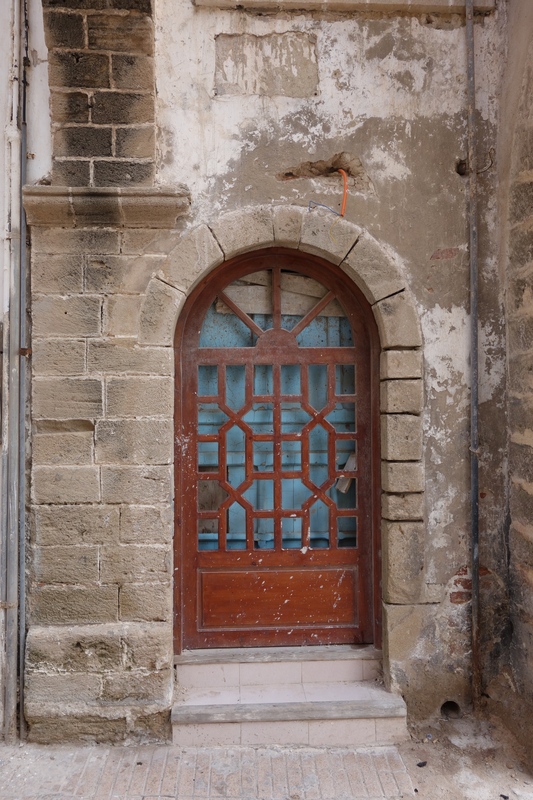 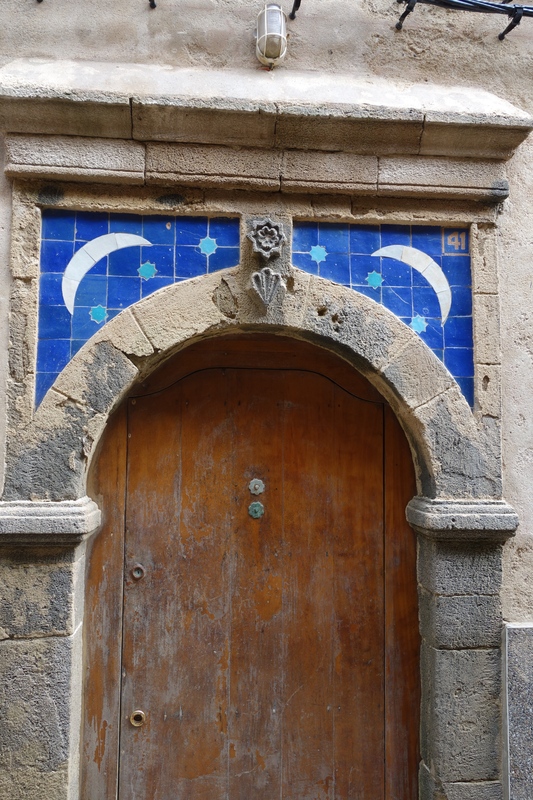 Doors provide ornamentation and are a key architectural detail. 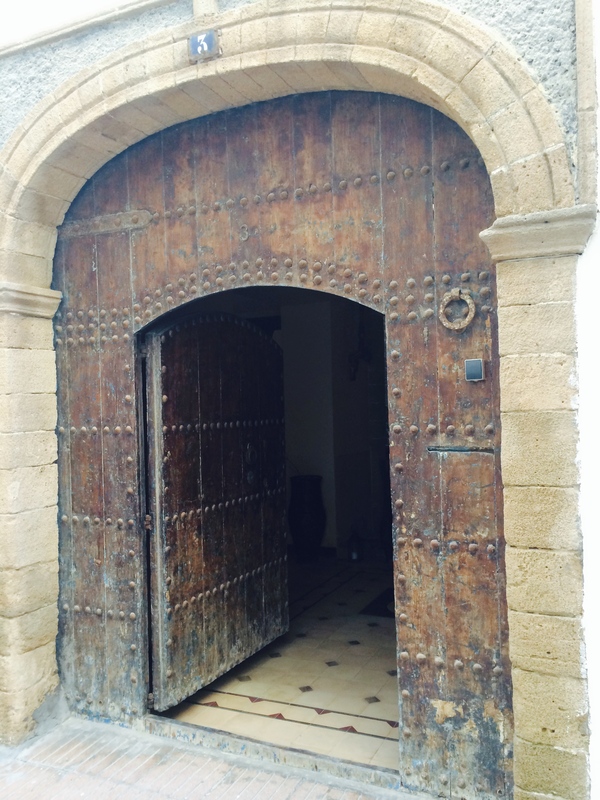 The front entrances can oftentimes be large and oversized. 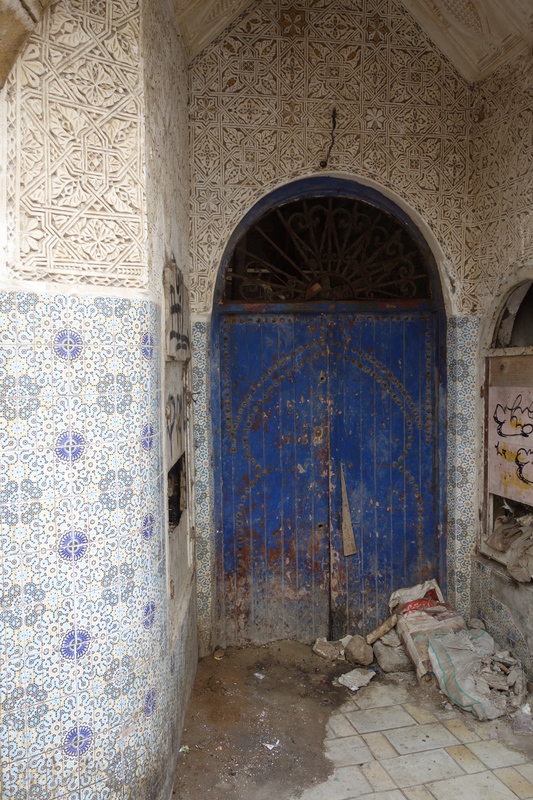 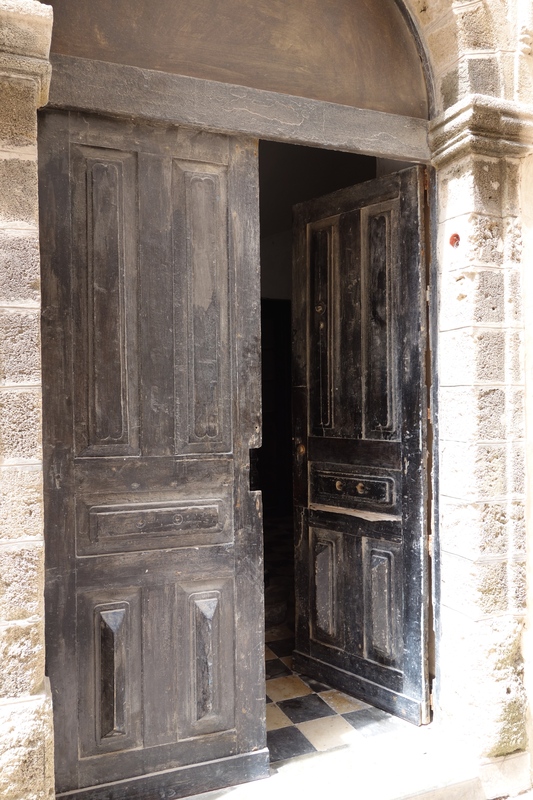 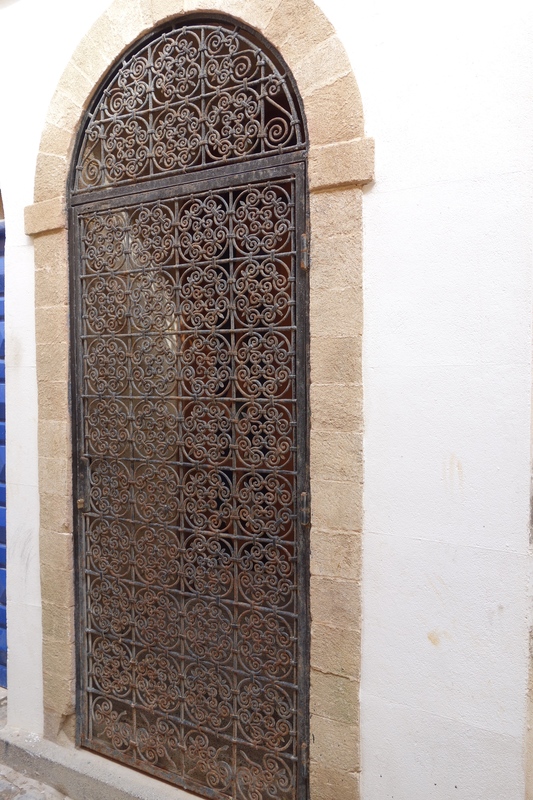 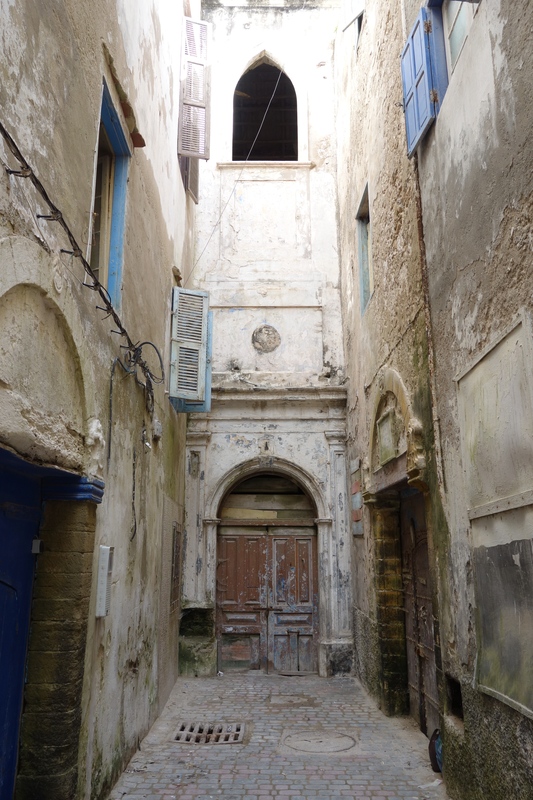 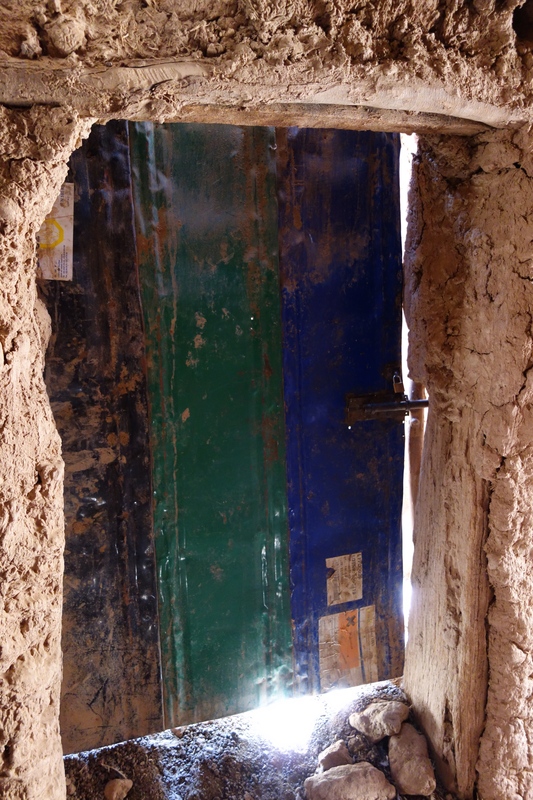 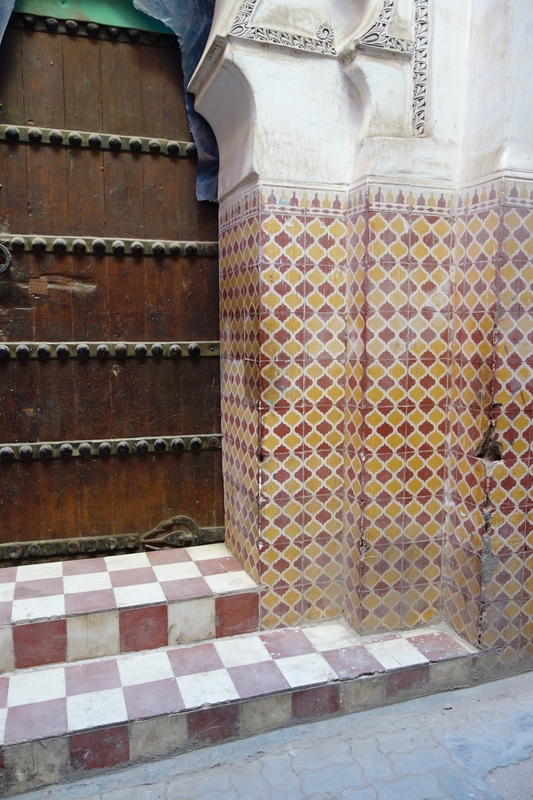 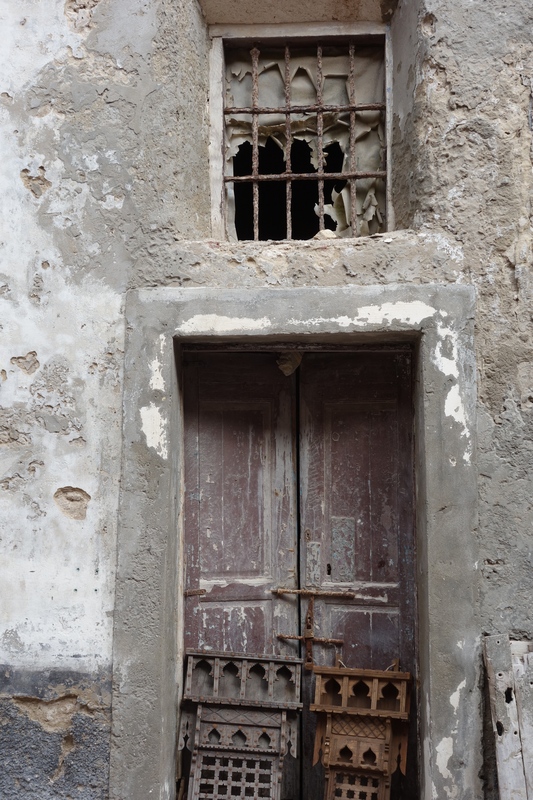 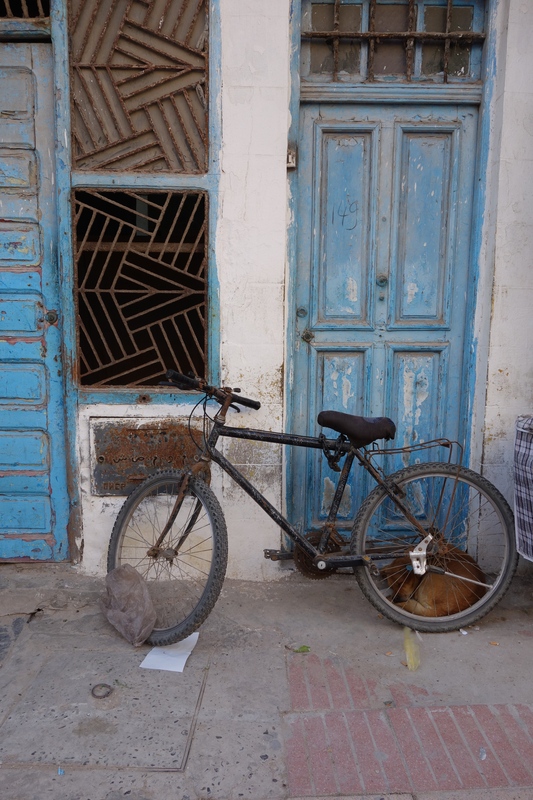 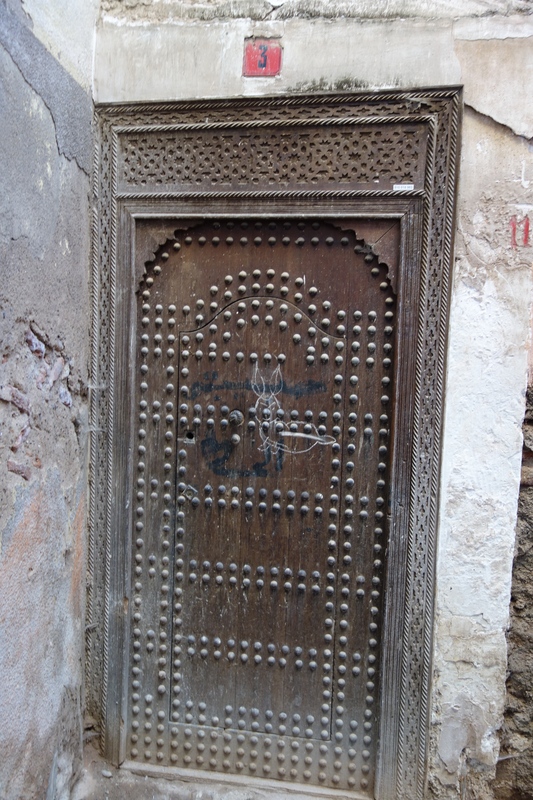 In the medina not all of the front doors fully open, sometimes one must bend down to enter. 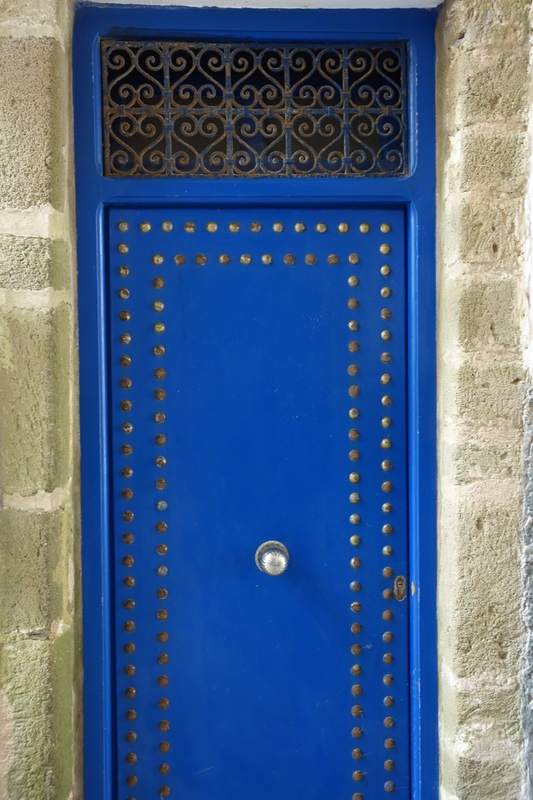 Adornments that are used are large exposed hinges, metal studs, various styles of door knobs (which are not alway placed on the side), color, fabric, door knockers and metal detailing. 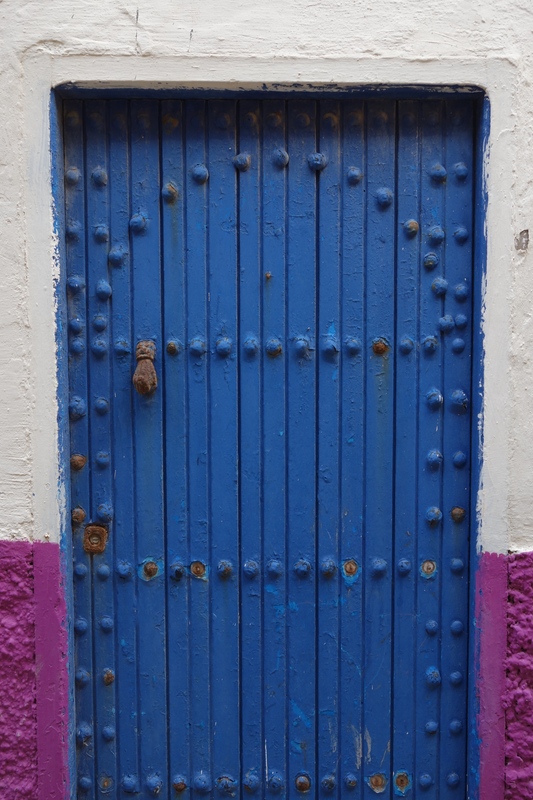 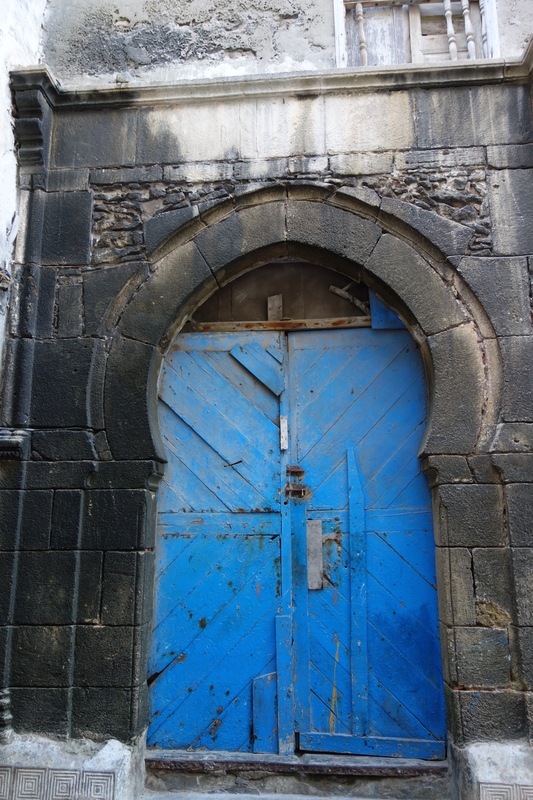 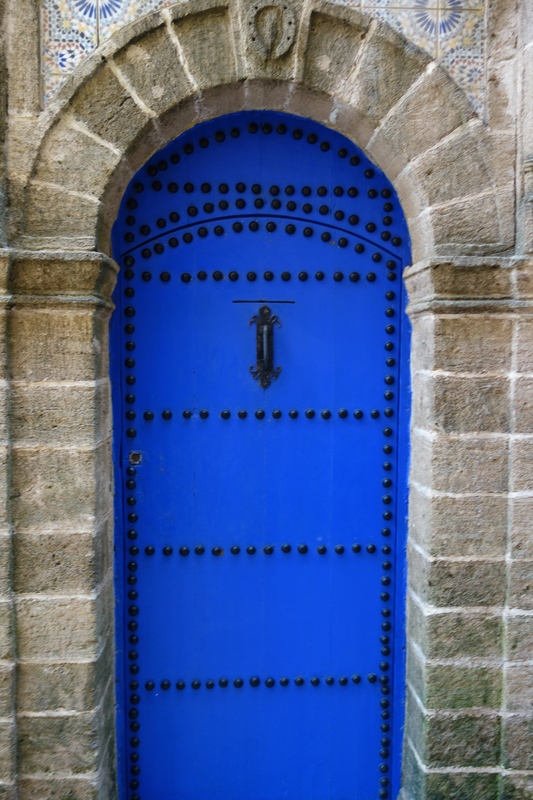 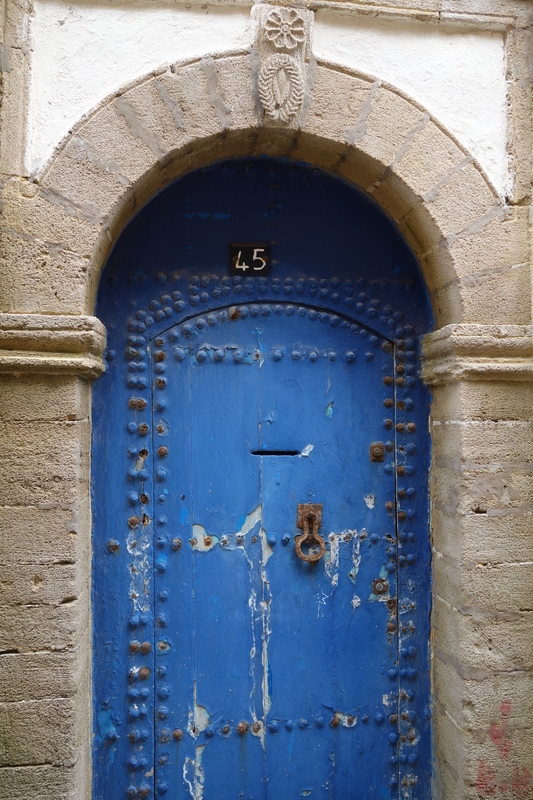 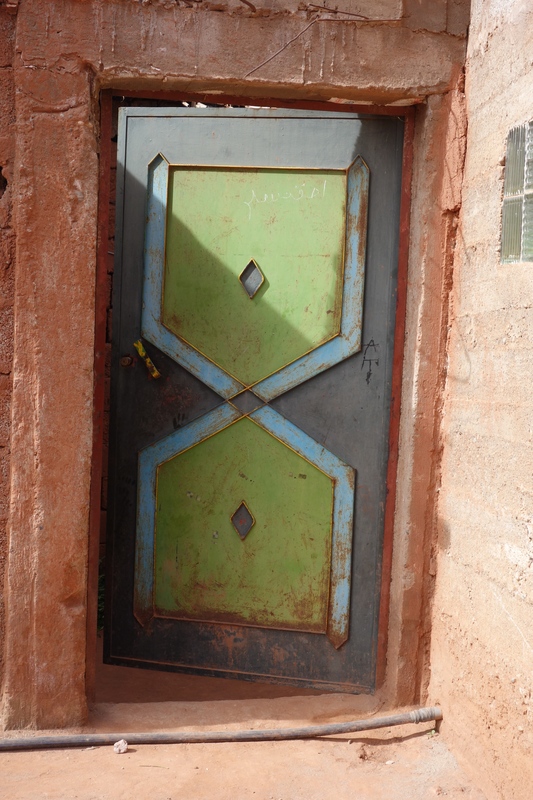 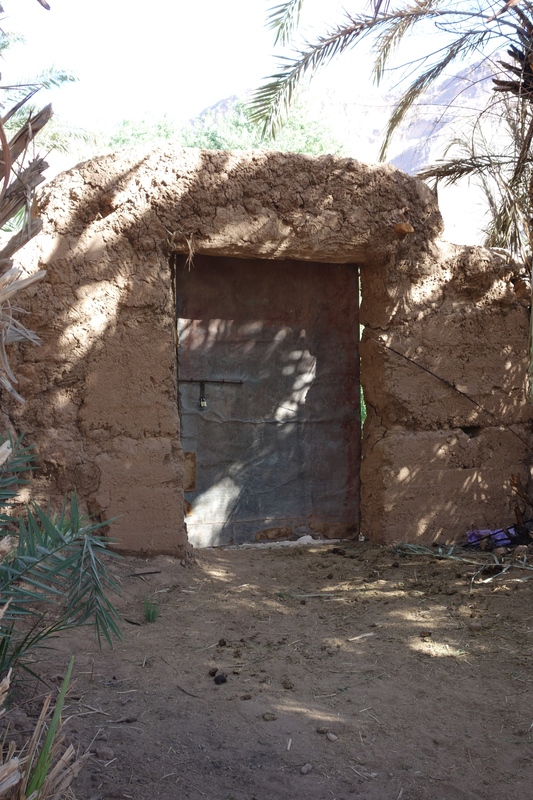 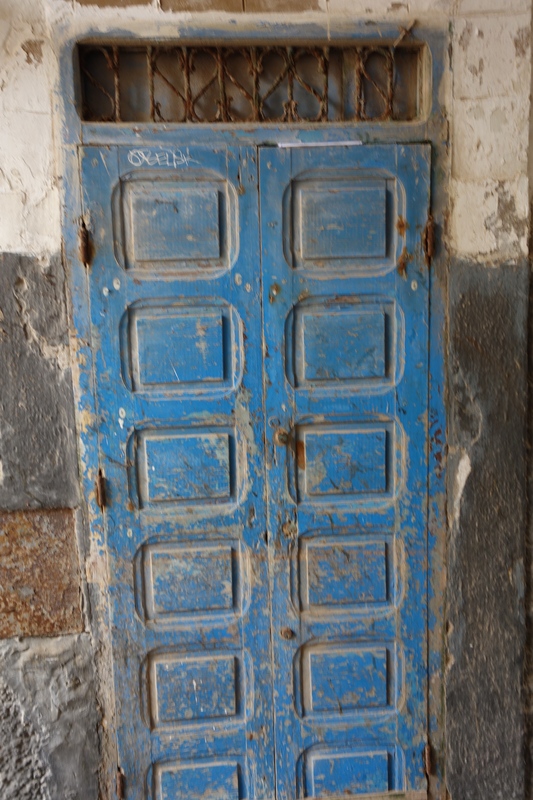 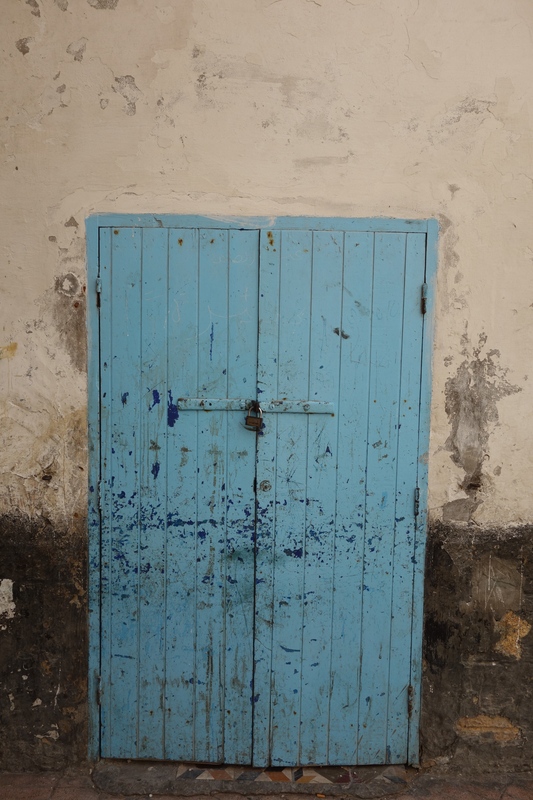 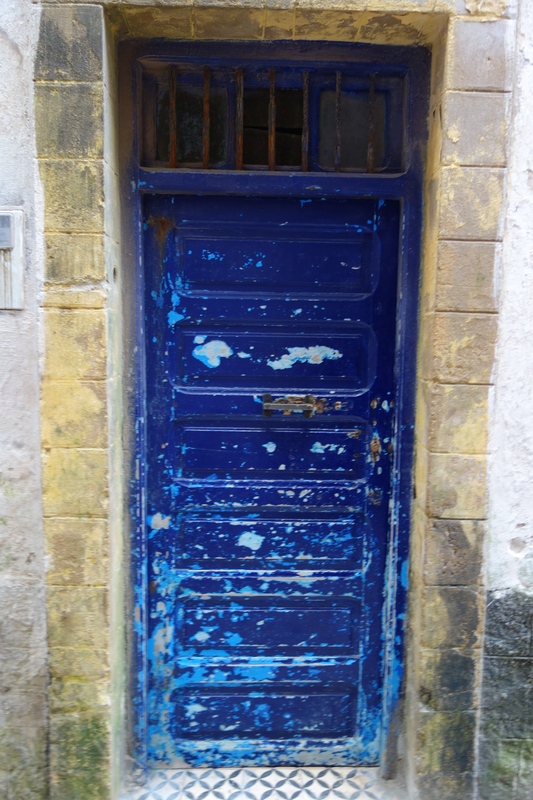 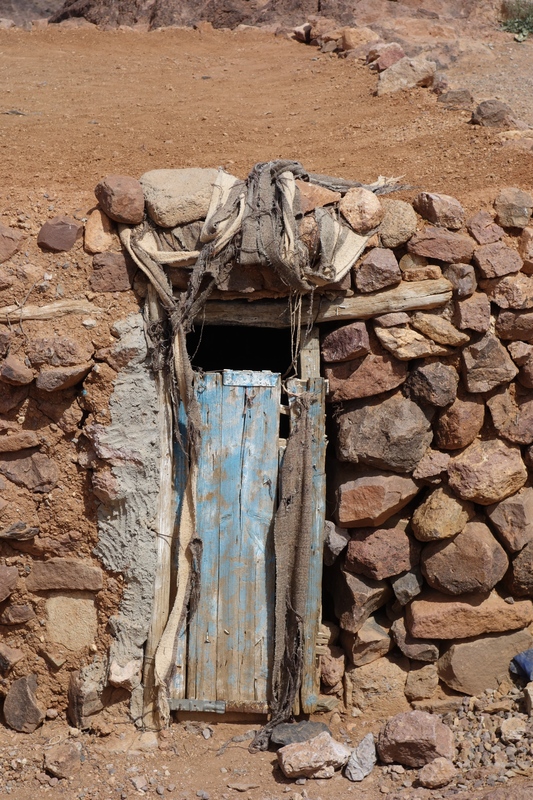 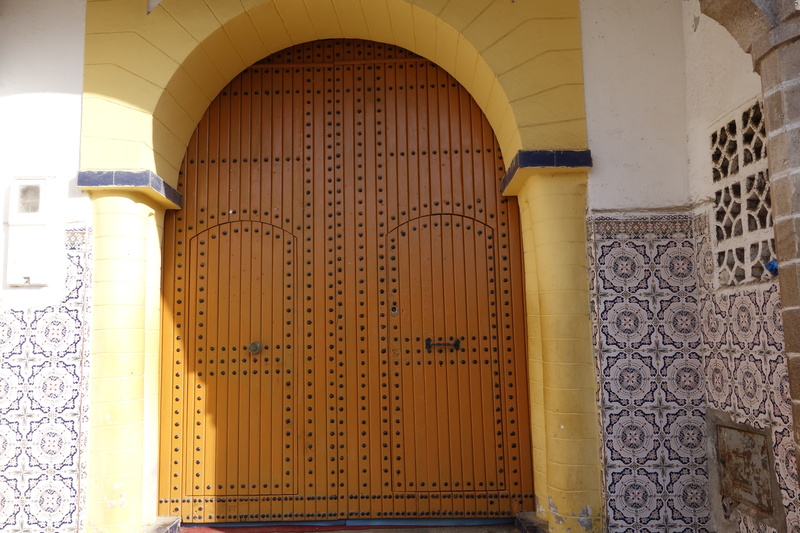 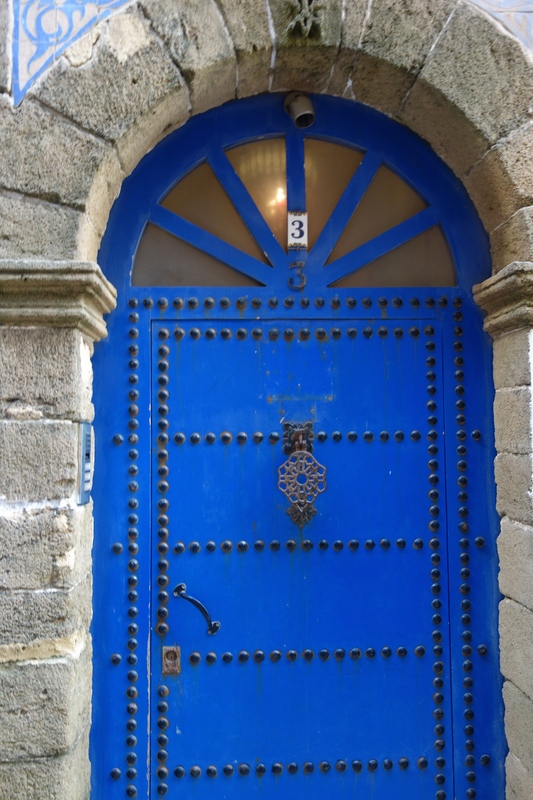 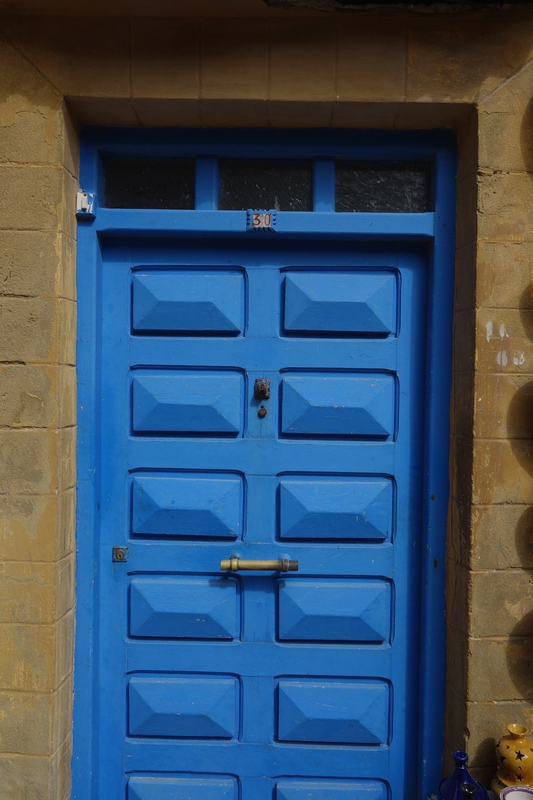 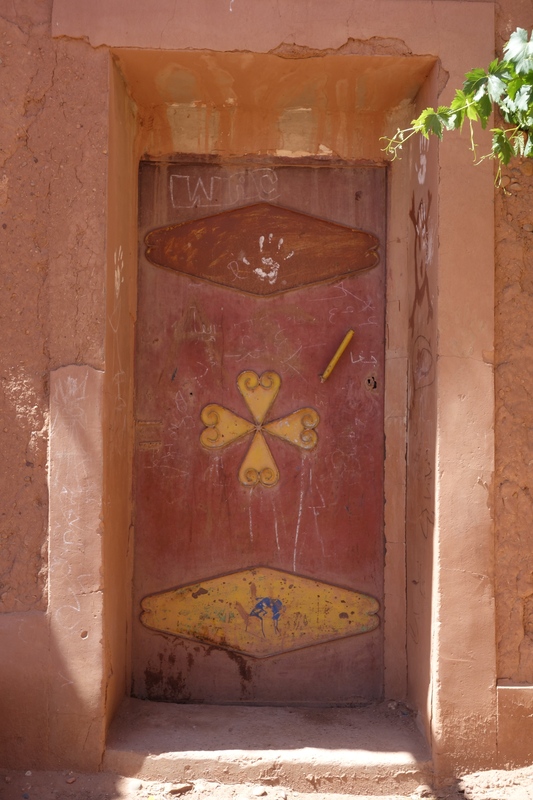 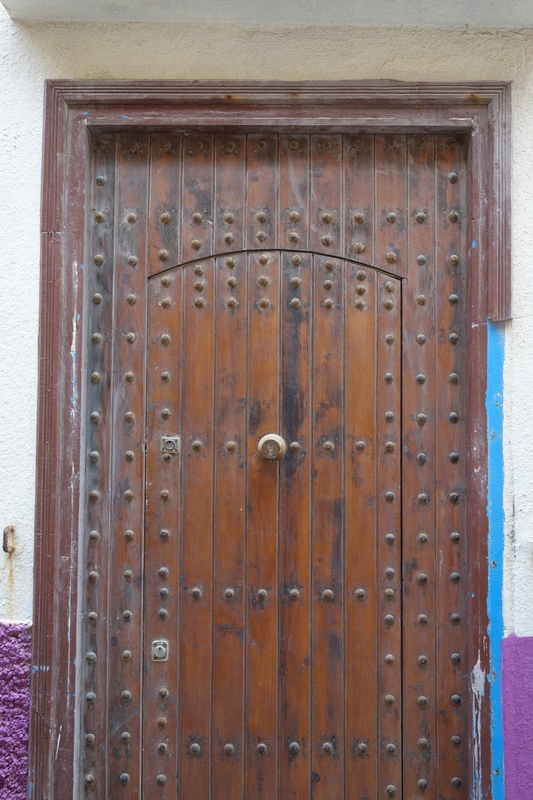 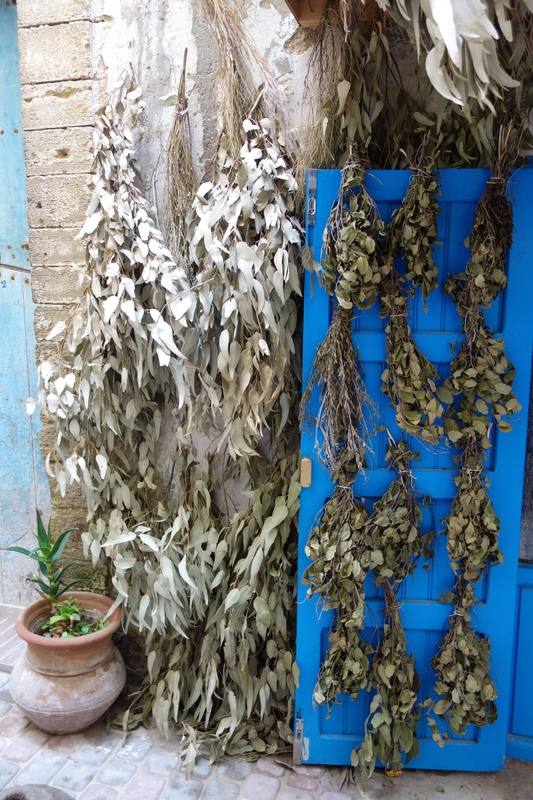 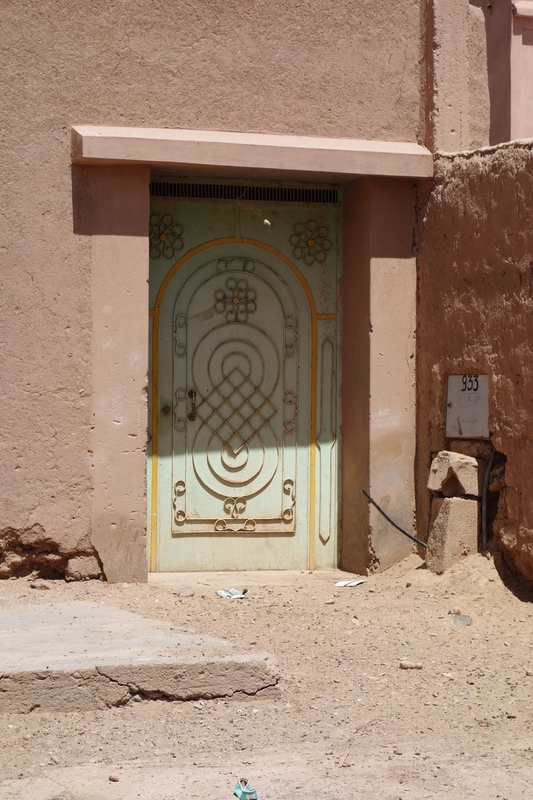 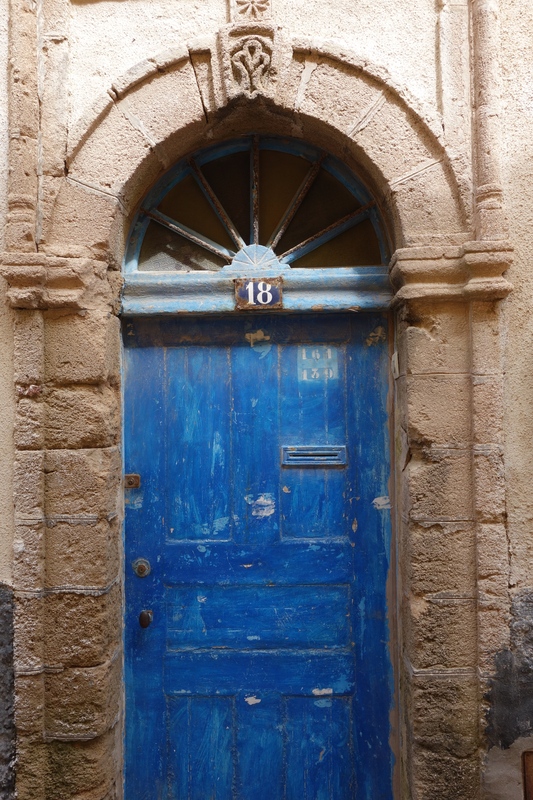 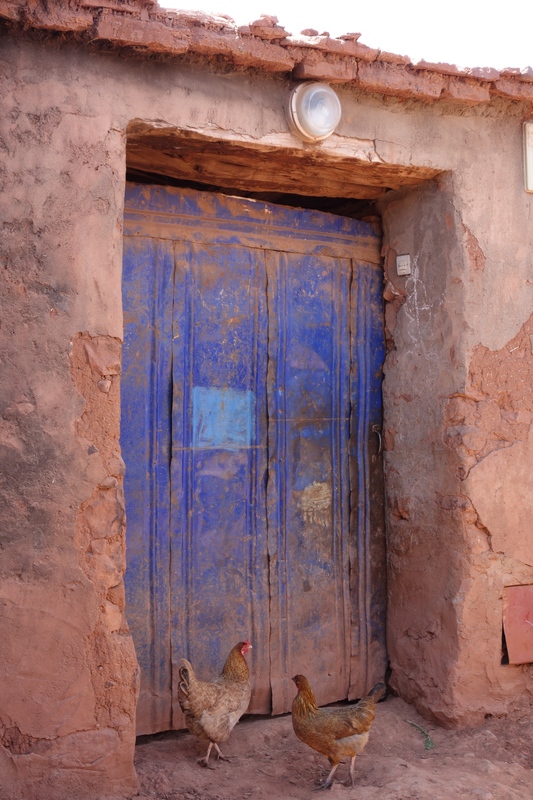 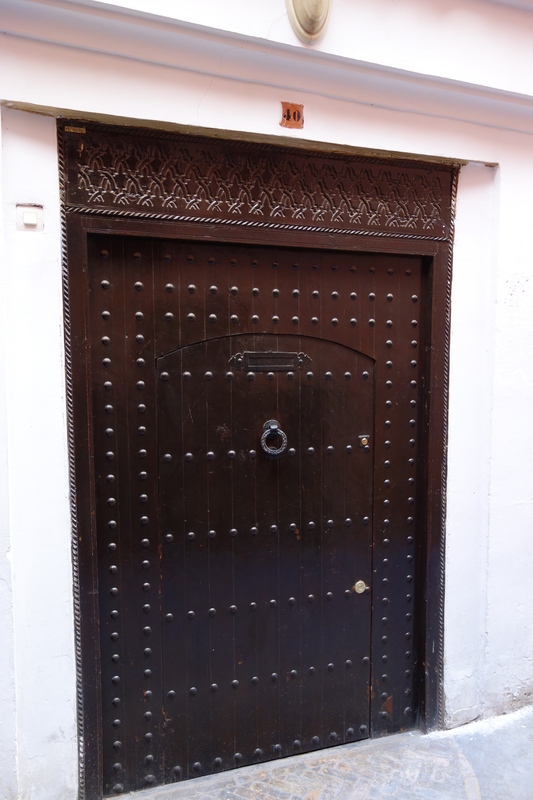 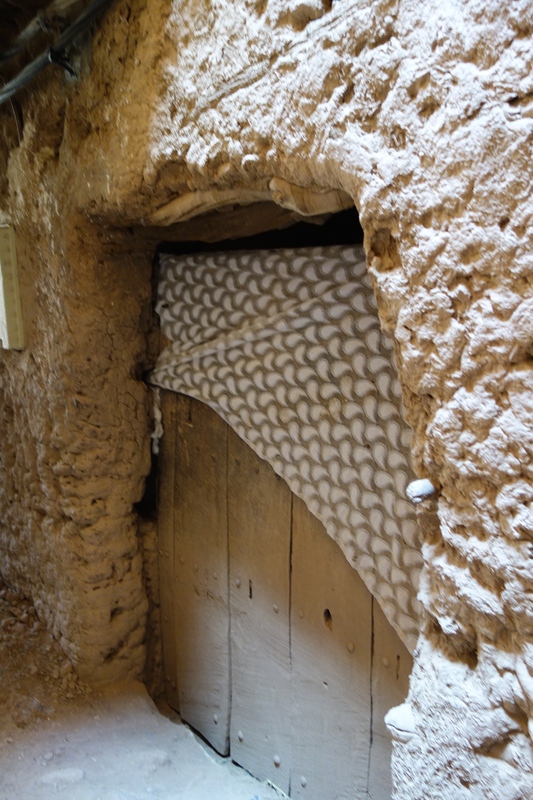 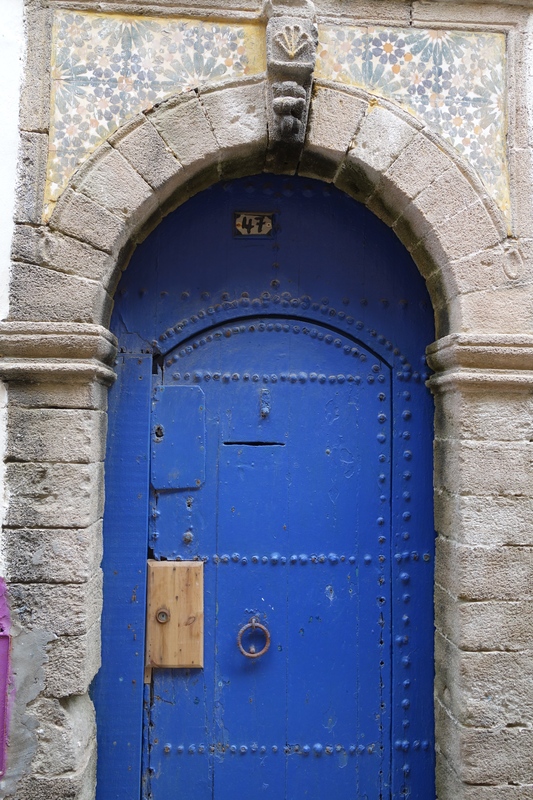 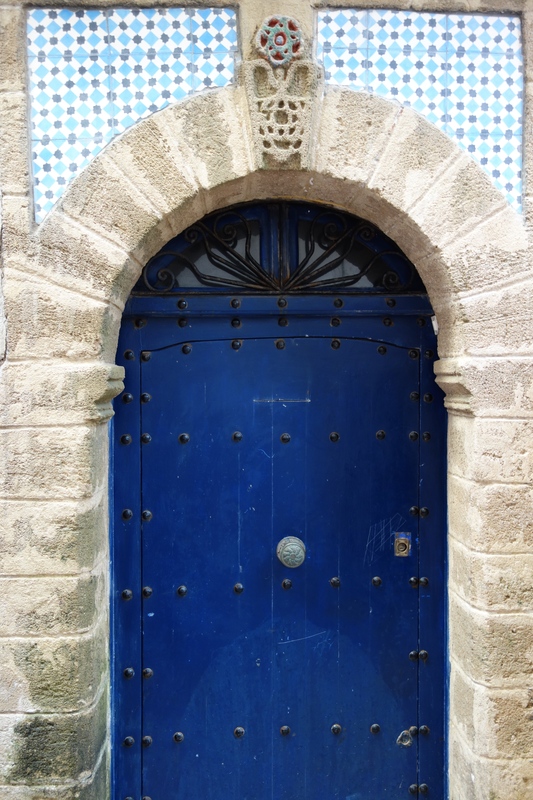 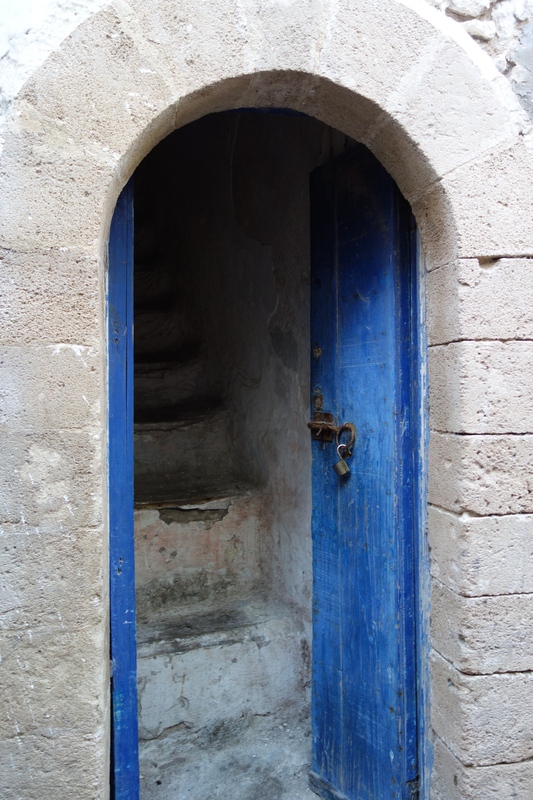 If the door is painted Moroccan or Marjolle Blue, or if it has the horseshoe shape around the perimeter, it is believed to protect the household from the evil eye. 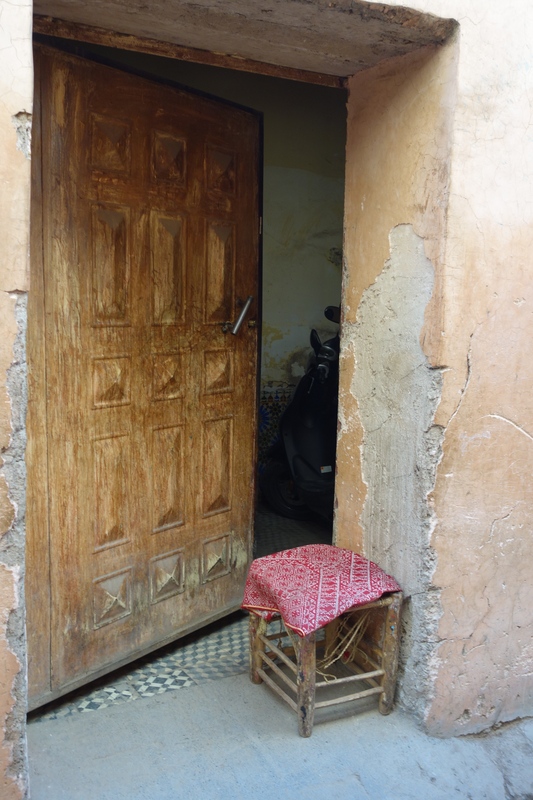 No matter what the home owners economic situation is, they always show their creativity and personal style with their front entrance. 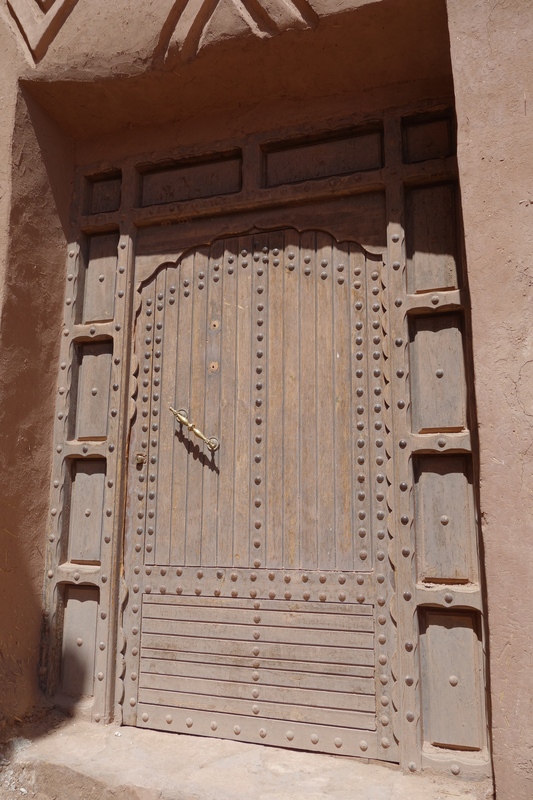 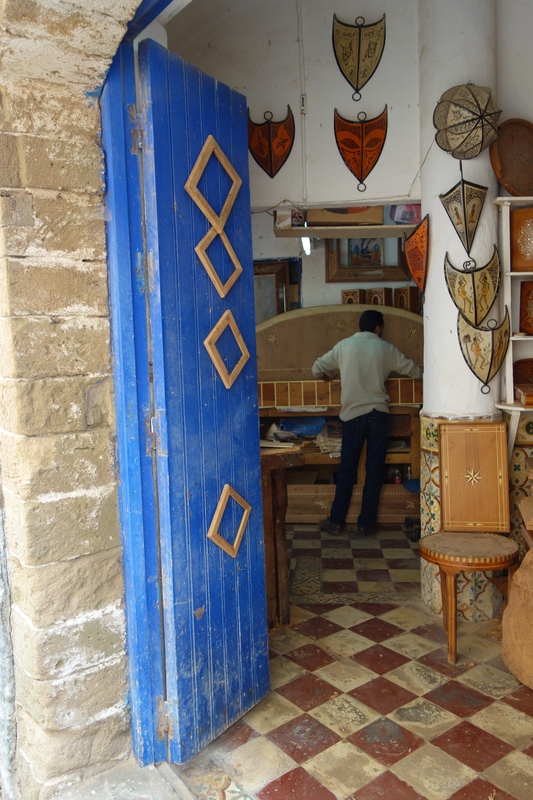 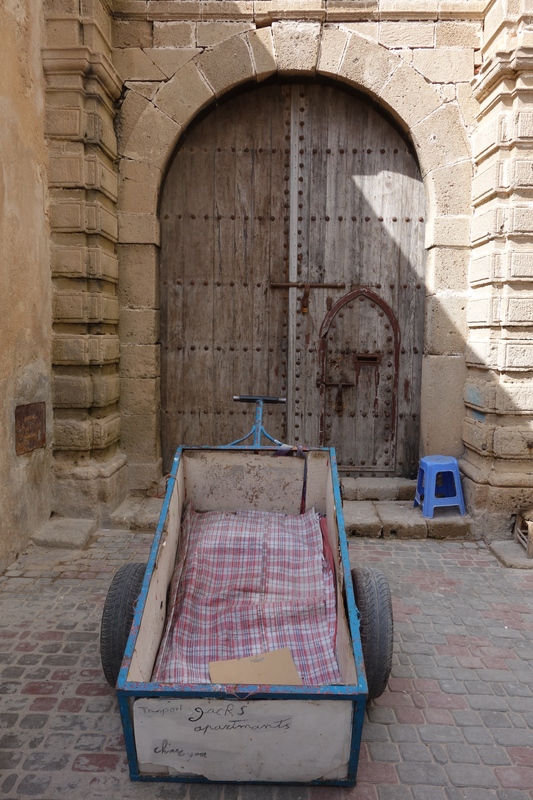 More posts on Morocco to follow shortly. 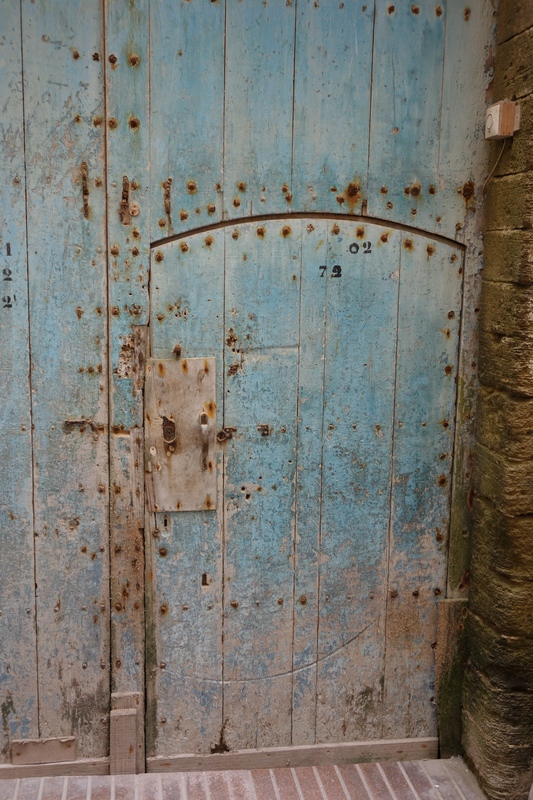 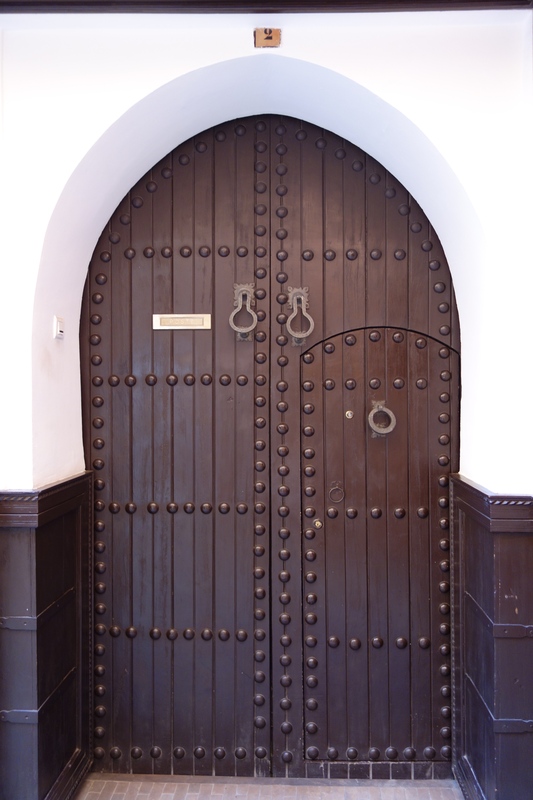 Of course, there will be a post on what is behind these doors. 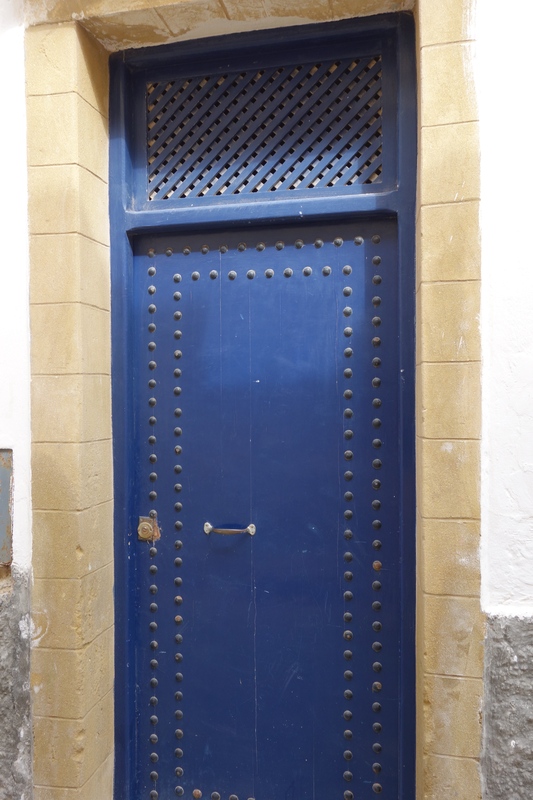 I *love* doors! 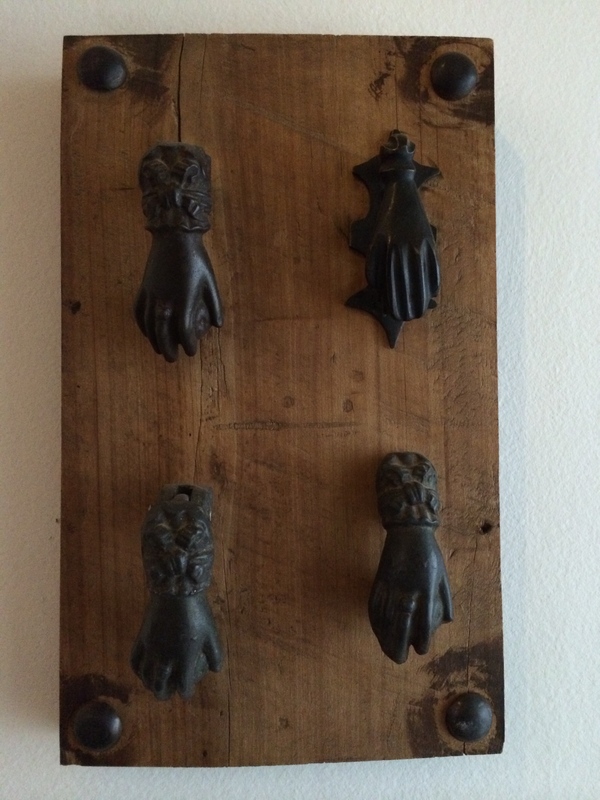 I love what they symbolize but also I just really love looking at them. 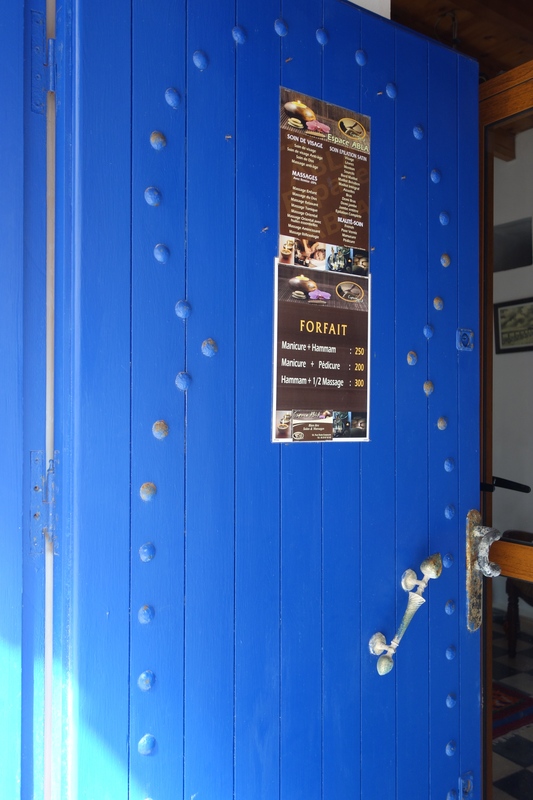 Thanks for this! 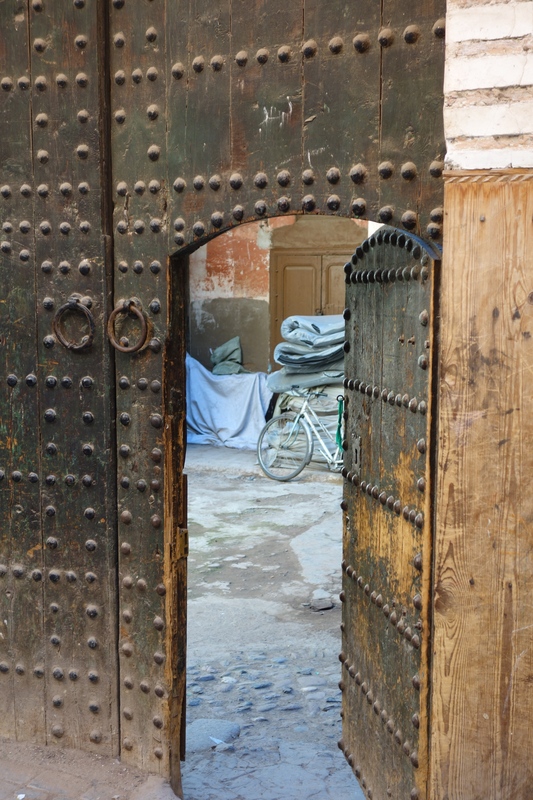 Wish I could visit Morocco someday too. 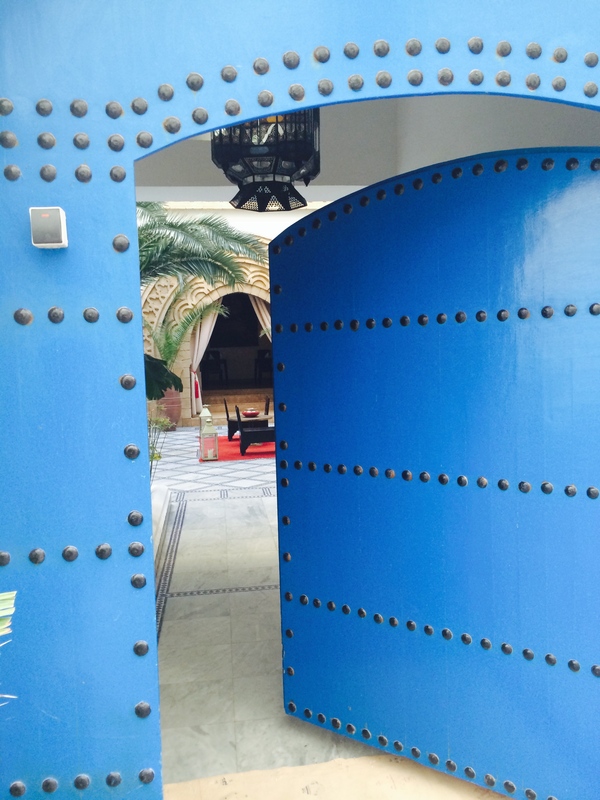 Best of luck to you!